The promise of microservices is better agility, scalability and reusability by breaking monolithic applications into small, purpose-specific services. But the real-world implementation of microservices is more complicated, and unlocking those promises means overcoming challenges associated with distributed processing, ecosystem integration and service harmony. PubSub+ is an advanced event broker, which means it supports the publish-subscribe messaging pattern and a host of enterprise-grade features and capabilities that enable event-driven communication between apps and microservices in any environment. PubSub+ is a unified, tomorrow-proof solution that is available as a service, as software or as an appliance. 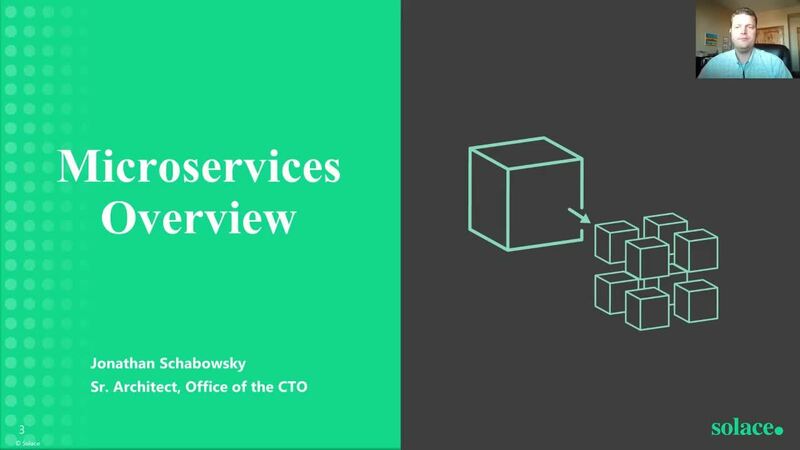 Since they are single in purpose, microservices must be orchestrated and communicate to provide real business value, all while being deployed into diverse cloud and on-premises environments. Today most organizations fall back to using RESTful HTTP request/reply to do that, but as systems scale up and the need for service orchestration becomes more important, the functions provided by the publish/subscribe messaging pattern become necessary and valuable. Pub/sub messaging lets microservices exchange information without needing to know the location or status of a system they want to send it to. Publishers of information simply send messages to the message broker which handles delivery to any number of services. This loose coupling allows microservices to be ready for the inevitable evolution of business requirements and application infrastructure. As applications and enterprises grow, the ability to easily increase and decrease capacity to handle variable load in the system becomes one of the most important advantages of deploying a microservices architecture. Enabling dynamic and elastic scalability of your microservices will improve efficiency and reduce costs. Event-driven architectures and the publish-subscribe messaging pattern enable the dynamic scalability of microservices as in this system they’re decoupled and operate asynchronously (non-blocking). This system also makes it straightforward to scale individual services or a group of services, rather than having to scale the entire system (which is often necessary when microservices are tied together with synchronous communication patterns like request-reply over HTTP/REST). Advanced event brokers like PubSub+ can persist all messages to guarantee delivery, and to serve as a source of truth in the event of massive failures, enabling rapid disaster recovery without any risk of message loss. If individual services or network links are temporarily unavailable, PubSub+ enables healthy services to continue processing as they are not blocked on the failed service. And when failed services are operational again, it will be sent whatever data had accumulated during the downtime. When microservices are communicating synchronously with one another, it’s a waste of resources to have threads blocked while waiting for a response. With asynchronous messaging, applications can move on to perform other work once they’ve sent a request for information, instead of waiting for a response.